Winemaker Thomas Bougetz has a background in science and technology, but his interest in wine led him back to school to study winemaking at the Northwest Wine Academy in Seattle. The emphasis is on Cabernet Sauvignon from various regions in the Napa Valley, but Bougetz works with vineyards stretching from Santa Barbara to Eastern Washington. 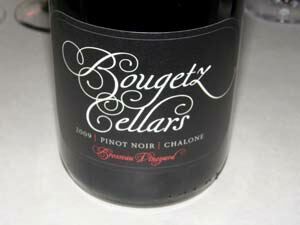 A PInot Noir is offered from the Sonoma Coast and Russian River Valley.